Normally open Sunday mornings throughout the year and Wednesday evenings from mid-April to mid-October. 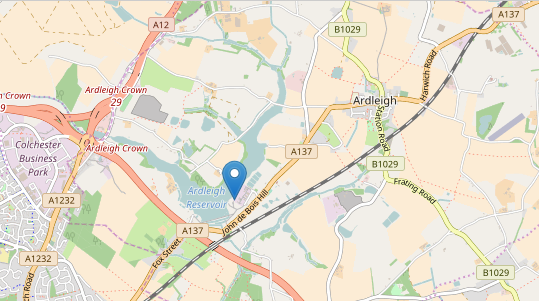 Ardleigh Sailing Club is situated about 3 miles north of Colchester just off the A137. If travelling to the club via the A12, exit at the Colchester North junction (A1232) and head towards Colchester town centre. After passing a number of car dealerships and a set of traffic lights, turn left at the roundabout sign-posted St John's. Follow this road and turn left at a mini roundabout on to the A137 towards Maningtree. As this road veers to the right, it crosses a dual carriageway (the A120) and drops steeply; it then veers to the left and proceeds uphill. A few hundred yards after the road has flattened out, look for a turning on the left which is Clover Way. Follow signs for the club and fishing lodge and follow this road around to the club. Please note that the club and fishing area are protected from unauthorised vehicle access by a series of padlocked gates. These are locked outside of the club's racing/social times. Members are issued with codes to allow access through these gates and into the clubhouse changing facilities. Pedestrian access is always available.